German Mercedes-Benz fan site, Mercedes-Fans.de, reminds us that the Brabus recipe for success is to take a Benz model and slide the "style" and "performance" bars as far up their buyers' menu of awesome that they want it to go. 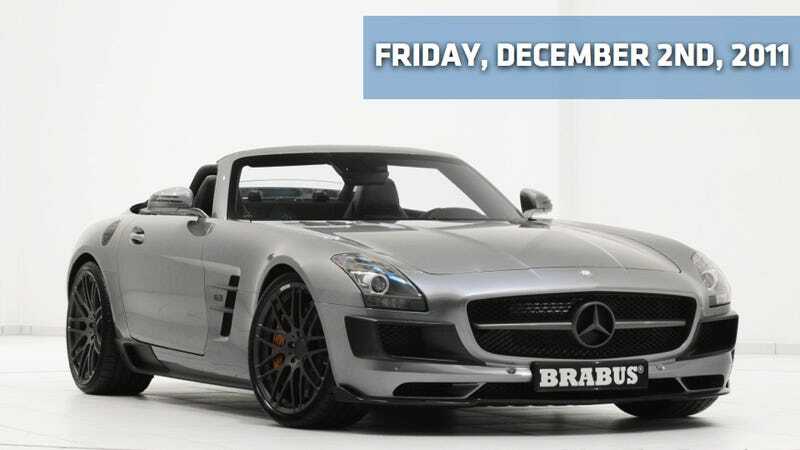 The Brabus SLS AMG Roadster, unveiled this week at the Essen Motor Show, is proof positive of that tasty recipe. On the exterior, they've replaced a load of body trim pieces with carbon fiber, and on the inside, they've made similar changes — including the addition of a 400 km/h (248 MPH) speedometer. There's good reason for that as the power's been tweaked as well. Because what else would we expect from Brabus? They're offering two different tuning packages — the first is a 700 HP twin-turbo power kit, and the other is their B63 S performance kit — which changes the fuel mix and exhaust system for a peak output of 611 HP. Yum. Bloomberg's reporting this morning that Subaru is halting sales of three of its four 2012 models in the U.S. to recall the cars for a brake defect. About 3,000 Impreza, Legacy and Outback vehicles are affected, Michael McHale, a spokesman for the company, told Bloomberg by telephone today. Subaru cars sold in other countries contain the same types of brakes, he said, without specifying if they would also be recalled. "It's excessive brake travel, so when you press the brakes, it just feels a little off," McHale said. "The brakes still work fine." The Forester sport-utility vehicle, which has different parts, isn't included.The recall is being done to replace master cylinders, McHale said. The repair can be done in about an hour. McHale said he doesn't know which company supplied the defective parts. USA Today is reporting on a new brand study by J.D. Power and Associates showing Mini and Lexus dealers leaving new car buyers more satisfied than any other brand. Lexus leads Cadillac, Mercedes-Benz, Porsche and Land Rover in luxury cars, with Lincoln and Audi hanging behind as the most improved brands. When it comes to the more mainstream car brands, Mini was first, for the second-consecutive year. Behind the itty-bitty BMW brand is Buick, GMC, Volkswagen, Chevrolet and Scion. Most improved? Volkswagen, Scion and Nissan. Nowhere to be found? Chrysler. Honda is recalling 304,000 vehicles globally for air-bags that may inflate with too much pressure in a crash, send metal and plastic pieces flying and cause injuries or deaths. And death can, of course, sometimes lead to fiery death. And if that doesn't make sense, fear not — it's Friday morning and we're pooped. So just take it as a loss and move on, k? Anyway, the Associated Press says Honda's reporting 20 accidents so far related to this problem, including two deaths in the U.S. in 2009. The Japanese automaker announced the recall early this morning and it affects the Accord, Civic, Odyssey, Pilot, CR-V and other models, manufactured in 2001 and 2002. The majority of the vehicles can be found here in the United States. "You wouldn't know it from the buzz ahead of this weekend's Tokyo Motor Show, but Japan has fallen out of love with cars" is an interesting entrée to a mini-rant on the Tokyo Motor Show and Japanese car culture by The Wall Street Journal's James Simms. The only problem we've got with that lede is we don't remember there being any buzz ahead of this year's Tokyo Motor Show. Which is sort of why we didn't go. But otherwise, it's a good read — and a good way to finish our coverage of the super number one best auto show from the land of the rising sun. Although reports indicate GM may be looking to redesign the battery packs on the Chevy Volt in the wake of NHTSA's nascent probe into three fires during testing. Now the ever-hungry eye of the media is shifting to Iredell County, N.C., where investigators are sifting through the ashes of a house fire on Oct. 30th that burned a garage where a Chevrolet Volt was being charged. But, despite local utilities saying it appears neither the plug-in hybrid nor its plugged-in charger was to blame, it's not stopping the media from freaking out. Turns out that it'll likely end up being the power company or their vendors who are to blame. That said, this is precisely why I'm never planning to install a gas station in my house.